Submitted 3 months 3 days ago by feeds user. Cabela's 7x50 Fathom Marine Binoculars Built-in illuminated compass aids in navigation Feather-light yet durable magnesium-alloy chassis Fully multicoated lenses for superior light transmission O-ring sealed, nitrogen-filled and IPX7-rated Cabela's 7x50 Fathom Marine Binoculars are a must-have on your boat. Built-in compass illuminates at the touch of a button, so you can easily navigate in low-light situations. 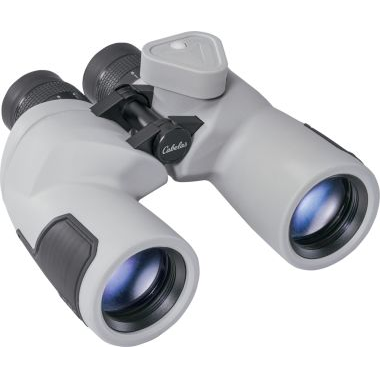 Feather-light magnesium-alloy chassis is 60% lighter than aluminum or plastic composite but is incredibly strong and durable, making these binoculars easy to take with you on your adventures. Fully multicoated lenses with multiple anti-reflective coatings deliver superior light transmission and a brighter image. O-ring sealed and nitrogen-filled for waterproof and fogproof performance. IPX7 waterproof rating. Cancer and Reproductive Harm- www.P65Warnings.ca.gov.